I propose thinking here about things which the new version SHOULD include. My first suggestion is that the focus should be on time rather than space. And by time, I don't just mean historical stories, though I'd like to see more of those, or, worse, stories about the future (never convincing somehow: the most insuperable problem is fashion). No: I mean stories which foreground the Zenonian paradoxes implicit in the possibility of Time travel (there are Zenonian paradoxes implicit in the 'ordinary' conception of time, for that matter). There was, so far as I remember, and I'm sure that someone will correct me if I'm wrong (please do!) a disappointing paucity of Doctor Who stories which involved time paradoxes or anomalies. City of Death from the Douglas Adams era strikes me as one of the best stories on this theme. An alien split into twelve personae (each stranded in a different era) mounts a cross-temporal plot involving art forgery (six copies of the Mona Lisa). 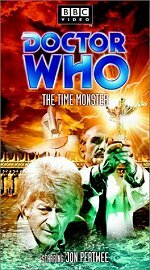 There was 'The Time Monster' from the Pertwee era - regarded by many as risible, but which I think of as a delightfully psychedelic curio. Atlantis! The Master! Ingrid Pitt! And a monster called a chronovore (what a neologism). How could anything involving all those elements be entirely bad? Still, it did little with the chronovore concept, and the time theme wasn't really explored far beyond a few scenes of hapless UNIT soldiers being temporally frozen.